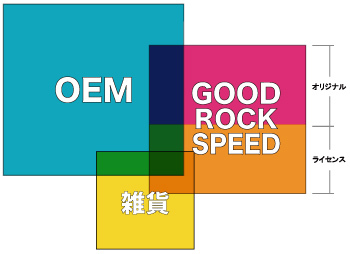 Business lineup ranges from “OEM” for specialty stores and brand stores to development of our original brand “GOOD ROCK SPEED” (hereinafter refers to as GRS). Specialized in development of cut & sewn products with characteristic graphic design, approximately 80% of our both OEM and GRS products has been developed using graphic designs based on obtained “licenses of copyrights and portrait rights”. In addition, with furnishings included in our lineup other than cut & sewn products, we also supply products to apparel brand stores and a theme park in Maihama. Our “manufacturing” thoroughly sticks also to graphics to be printed let alone todetails of materials and shapes of cut & sewn products. We have been continuously studying printing techniques capable of maximizing attractiveness of graphics in cooperation with printing factories with high techniques across Japan. 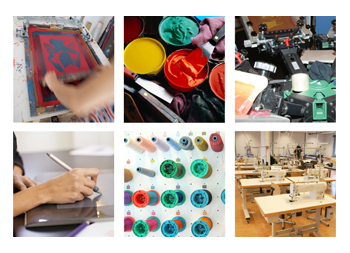 Further, with insistence on post processing such as “wash finishing”, “dyeing” and “damage” processing, we are always searching for what our clients demand as well as we desire to create. We enter into license agreements by selecting such contents from our unique perspective that are excellent with cut & sewn products from among various scenes in pop culture and sub-culture including arts, music, characters and films, by focusing on keywords such as “fashion”, “vintage” and “trend”. “Manufacturing” based on these licenses facilitates it possible to distinguish your products from competing products resulting in creating high additional values. “Happiness” and “Satisfaction” for customers, suppliers and us all obtained from products. Product development to be remembered in all of those who have involved.